Cambridge terms are fast and furious. They are jam-packed with people, memories and lessons. Reflecting on this year, I can see how much I have grown as a person. I also know that I have a lot more to learn in the years ahead. I have realised that growth and change never operate on a solely upwards trajectory. The entire process of learning involves failure, wobbles and mistakes. My first year at university involved a lot of learning curves, the majority of which stem centrifugally from the experience of living alone for the first time. The academic rigour of Cambridge is but one part of the learning process of university. Each Cambridge term has thrown in my path new challenges. Terms flew by, hectic and loaded with life lessons. The growth we experience is far from linear; it is complex and winding and often makes little sense to us at the time. The contents of each term comprises my habits during that time. Lent was Espresso Library and avocado toast with friends, while Easter was Michaelhouse café where I would while away hours revising. It isn’t just the habitual coffee pit stops and over-played albums that belong with each term, however. Each of those solid eight week blocks also contain lessons borne from the new experiences I encountered in my first year. Having taken a gap year, I matured a lot before starting my time as a fresher at Cambridge. 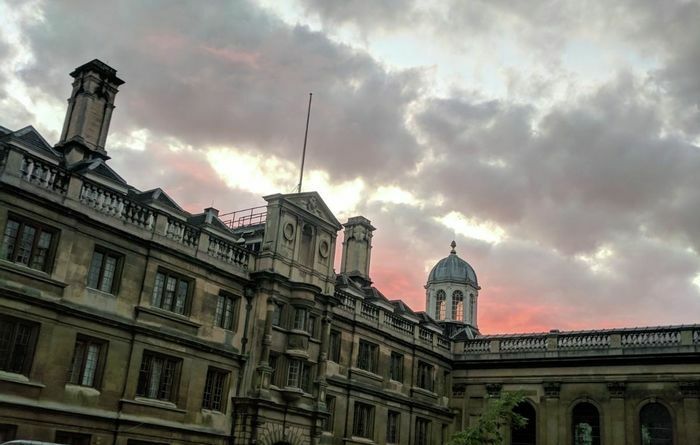 Working in the ‘real world’, a world of inconsistent and tiring hours, I had done a lot of growing up before I even stepped foot within Cambridge’s cobbled city centre. However, I know that I have learned a lot and continued to grow in this past year. These lessons can be categorised by term, just as my café spots can. The biggest lesson of my first term involved getting used to spending time alone. While the beginning of university life is shared with the people you find yourself surrounded by in the strange curated communities of college halls, you also have to get used to spending a lot of time by yourself. Having been homeschooled, I had always been self-sufficient and happy in my own company. Even during A Levels, I was happier spending my free periods working or reading than I was being surrounded by people. However, there is a definite difference between enjoying your own company and living entirely alone. The process of living alone, of cooking, shopping and working by myself, was a step of maturity that I developed throughout Michaelmas. Finding those people that you belong with isn’t always a quick process. It was only by learning to enjoy being alone and feeling confident in myself that I also learned my second lesson of Michaelmas; instead of rushing to befriend the first people I met in college, I took my time over who I made friends with. The people I surrounded myself with in freshers week weren’t the ones I was missing over the Christmas break, or the ones I went to when I was stressing over exams in Easter term. With the benefit of hindsight, I am grateful that I was confident enough to be alone when I needed to be. The friendships and relationships I fostered in the past year were consequently much more meaningful, and I feel lucky to have connected with people who truly matter to me. If I could give incoming freshers any advice, it would be that finding those people that you belong with isn’t always a quick process. Trust that you will find these people; there’s no reason to rush to attach yourself to the first group of people you meet. If I had done so, my time at Cambridge so far wouldn’t have been half as happy or so well-spent as it has been. My first term at Cambridge was as much of a physical and emotional rollercoaster as I could have anticipated when, during my gap year, I would imagine what university life would be like. While I was looking forward to a Christmas at home with my family, I also couldn’t wait to return to Cambridge in the New Year. In many ways Lent Term was an improvement on Michaelmas; I had an established routine and people that I knew and liked around a city I had become familiar with. Yet, my memories of my second term remain somewhat clouded. Lent was a low point in my year – the hardest of my three terms. My social life suffered, as did my workload. Looking back at my supervision reports, there is a sense of decline in my enthusiasm from Michaelmas. I remember counting down the essays and the weeks until I could return home, a contrast with the more ebullient attitude I had felt towards my work in first term. Struggling during Lent term reminded me that life is far from a constant uphill trajectory. Looking back I feel I was more distant from myself and from those around me in Cambridge during this time, which is something I regret. But struggling during this term reminded me that life is far from a constant uphill trajectory. I had some wonderful times during Lent, but the saturated nature of Cambridge terms has left it blanketed with a caliginous atmosphere in my mind. That most of the photos I took in this time are grey-skied and gloomy only adds to the prophetic fallacy I have ascribed the term. If Lent is shrouded in a fog of uncertainty and dissatisfaction, Easter Term is cast in a golden light. Efflorescent is the word that comes to mind when I think about my third term. Being exam term, I find this somewhat bizarre. Yet the fact remains that Easter Term was the happiest of my Cambridge terms, a term where I feel I truly came into my own. Easter term contained exams, of course. But it also contained pub trips, sunsets, Waterstone’s cafe and Pembroke lawns. Garden parties, June events, fireworks and port. I had found my place. Easter Term was filled with people who mean a lot to me, their radiance over-powering the stress of exams. After the distance I experienced throughout second term, I felt refreshed again with Spring in full swing and the distractions on my mind from Lent term seemingly gone. I realised that I didn’t have to take every opportunity that came my way. In many ways, Easter was my least healthy term. I barely slept, doing as much work for Varsity as I did for my degree, and it certainly wasn’t without its stresses, yet I was the happiest I had felt in a long while. Having deferred my place at Cambridge to take a gap year, throughout which I felt a sense of purposelessness, during exam term I discovered how much I loved to be busy. Or perhaps I discovered what it was like to finally be doing something I loved. I was happy to sacrifice sleep for that. I had more opportunities and achieved more in this term than perhaps I had in my life up to this point. I learned the power of positive thinking, and developed a furtive faith in the law of attraction. With this, I also learned when and how to say no. I learned which opportunities to take, and which to turn down. Travelling to London several times a week for modelling and feeling an overall sense of dissatisfaction, I realised that I didn’t have to take every opportunity that came my way. I learned what truly makes me happy and that prioritising my own happiness in work is okay. I suppose the main lesson I learned was confidence. All of this is surmised for me in that word efflorescent. Portrayals of university life or of growth more generally often fall into a trope of linear progression towards an end-goal. The idea of reaching an ‘end’ point itself is as flawed as the idea of a linear journey. In life, we never stop growing. We never reach a final version of ourselves. The growth we experience is far from linear; it is complex and winding and often makes little sense to us at the time. The emotions I have experienced in each term of my first year reflect this.